The Scandic Grand Marina Hotel Helsinki is a popular hotel in Helsinki’s Katajanokka district, and is a short stroll from many of the city’s popular attractions. The Sibelius Monument is approximately 2 miles from the property, and the Presidential Palace is located less than a mile away. Other nearby attractions includes Kaivopuisto Park, Market Square, and the Uspenski Cathedral. 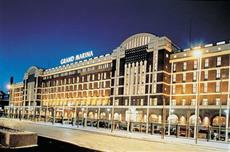 The Scandic Grand Marina Hotel Helsinki is less than 2 kilometers from the central train station. This 4-star property is comprised of 434 guestrooms; each room in the Scandic Grand Marina Hotel Helsinki comes equipped with an array of modern comforts to ensure guests are more comfortable during their stay. This property was originally built as a harbor warehouse in the 20th century, and a thoroughly marine feel is evident in the architecture. Visitors looking to sample Scandinavian dishes can head to the Scandic Grand Marina Hotel Helsinki’s on-site restaurant, which offers a selection of delicious meals and drinks and also has a play area for children. Lighter meals, snacks, and a wide selection of drinks can be enjoyed in the cozy atmosphere of the in-house bar. Health conscious travelers can make use of the well-equipped gymnasium.